It's time for our Big Reveal! If you haven't done so, please go to the Facebook page, and select your card #. 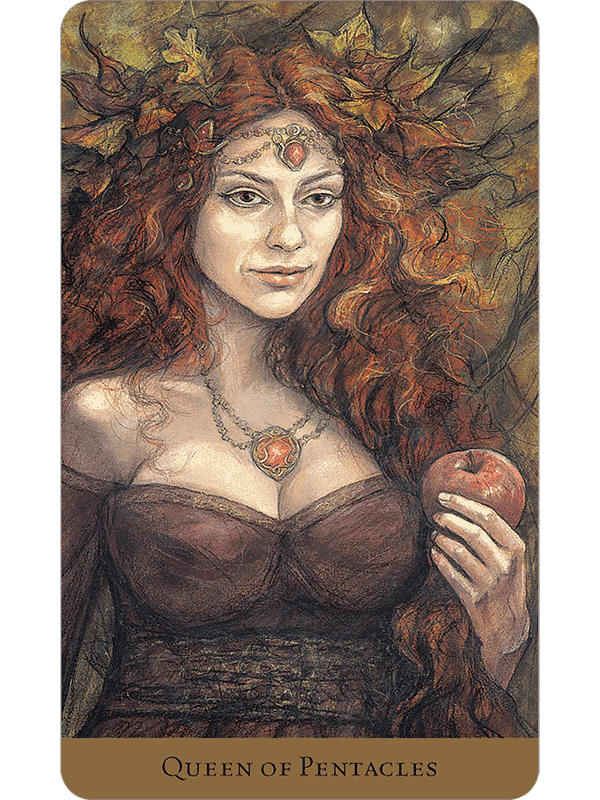 In a general Tarot spread, the Queen of Pentacles represents high social status, prosperity, wealth, luxury, success and financial independence. 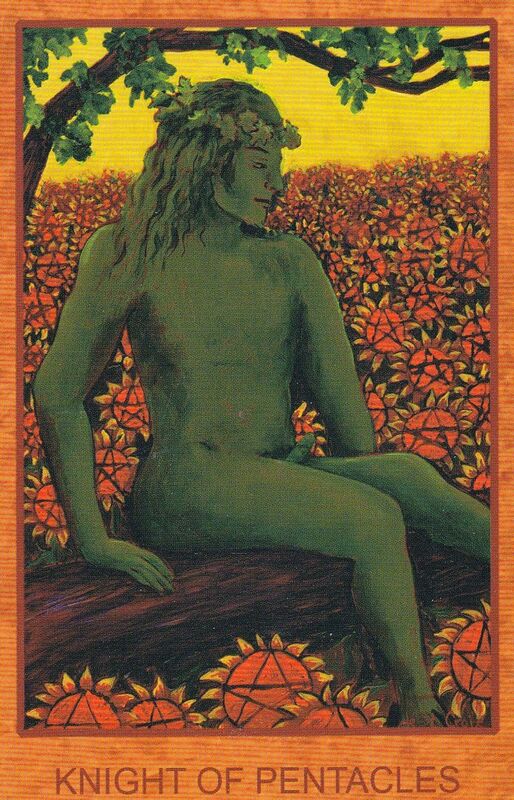 This card tells you to approach issues in a sensible, practical, no-nonsense manner and you will be successful. She tells you to set goals and work towards them, steadily. As a person, the Queen of Pentacles represents a mature female or feminine person who is generous and usually wealthy or financially independent, has an affinity for the finer things in life and is good in business. She is a social butterfly with high social status and is pleasant, charming, loyal, socially poised, organised, down to earth and practical. She is a wonderful, nurturing mother and a good cook or hostess. People feel welcome in her home, secure in her company, and able to confide in her. She may be an Earth sign such as Taurus, Virgo, or Capricorn. In a general Tarot spread, the Knight of Pentacles represents common sense, responsibility, practicality, working hard for what you want and finishing what you start. This card is a wish card that signifies achieving your goals through perseverance and determination. It can also represent being environmentally conscientious, and an animal lover. It might be representing you defending and protecting your home, family or those close to you. There is usually good news associated with this card. As a person, the Knight of Pentacles represents an adult (usually 20-35 year of age and usually male) who is stable, reliable, loyal and patient. He is ambitious, hard-working, protective and honest. He can also be conservative and a bit stubborn. The Knight of Pentacles may have issues with showing emotions. Usually, this is because he may have been raised by a father figure who had difficulty showing affection (an Emperor or King of Pentacles type of father figure). The Knight shows he cares by working hard to provide for the people he loves. He may be an Earth sign such as Taurus, Virgo, or Capricorn. Key words: Patient, practical, loyal, responsible, persistence, protective, hard-working. 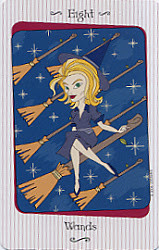 In a general context, the Eight of Wands represents hastiness, speed, rushing, progress, movement and action. It is a Minor Arcana card of sudden action, excitement, exciting times, travel, freedom, holidays and holiday romances. Whatever you turn your hand to at the moment will take off at great speed and gain momentum. You will be feeling positive and energetic. You will be thinking on your feet, seeing results and finding solutions. Your hard work will be paying off and you will be ahead of the game. The Eight of Wands also represents infatuation, obsession and getting carried away or being swept off your feet. The Eight of Wands in the present position is an exciting place. Look around – this is a golden opportunity of a time for you. Things are going your way. Sometimes we are so used to plodding through oppositions and setbacks that making strides and fulfilling goals creates an anxiety because the familiarity of failure is replaced by a strange success, as if it's almost too good to be true. Don't self-sabotage! Key words: Hastiness, speed, progress, movement, action, rushing, exciting times, travel, freedom. 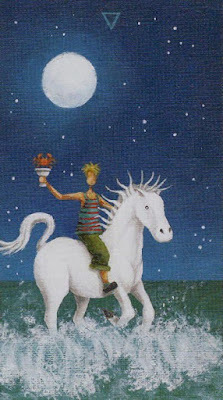 The King of Cups Tarot card represents kindness, compassion and wisdom. This card can indicate that you will be finding the balance between your mind and your heart. You may learn to control your emotions, and find the wisdom to accept that which you cannot change. You may be gaining a deeper level of emotional maturity. You may feel yourself becoming calmer, and more sympathetic to others. Like all the cups court cards, the King of Cups signifies emotion, creativity, artistic ability and intuition, but in a more balanced form. As a person, the King of Cups is caring, affectionate and empathetic. He is a good listener, diplomatic and easy going. He is the type of older male who will give you sound advice and act as a calming influence in your life. He usually has light hair and has few if any enemies as he is well liked and gets along with the majority of people. He may lack the drive to pursue material wealth as he is more focused on the emotional side of life. He is very family-oriented. He may be a water sign such as Cancer, Scorpio, or Pisces. How did you do? Come, join us on the Facebook page, and share your insights!